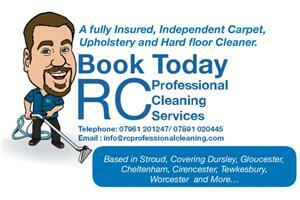 RC Professional Cleaning Services - Cleaning Services based in Stroud, Gloucestershire. RC Professional Cleaning Services is a family run business specialising in CARPET, UPHOLSTERY, HARD FLOOR,CONSERVATORY, UPVC CLEANING, GUTTER CLEARING BUSINESS AND PRESSURE WASHING. We pride ourselves on a fast response and the price we quote is the price you pay. We accept card, cash, cheques and bank transfers. We have 2 vans, on the first we have a Hydramaster truck mounted cleaning system. You can’t beat the power or the heat (controllable) from a truck mount with own water supply and petrol engine so we do not need any external power or water supply. Rob and Lucy both work on this van and Ben assists Rob when Lucy busy either on other jobs or doing the ever essential quote,marketing and paperwork. Truck mount extractor removes soil, chemicals and pollen from carpets easier than portable because the power and suction is stronger and water can reach a higher temperature. On the second van we have an X Line pure water fed pole system and a Genie gutter Vacuum and a 13 hp Honda pressure washer with a host of ladders and own water supply. We often attend a property together and clean all in one day. Unlike many large businesses Lucy will answer the phone or an email at anytime (day or night) so you can be assured of a quick response to any questions or information that you require even if it is 9pm on a Sunday evening. We cover both commercial and residential cleaning. We go that extra mile to make sure you the customer are 100% satisfied with all work carried out. We don't cut corners, we clean them! Occasionally jobs can take longer then we estimated however If we are delayed we will keep you informed. We run 7 days a week as we know people have busy lives and cant always be around during the week.